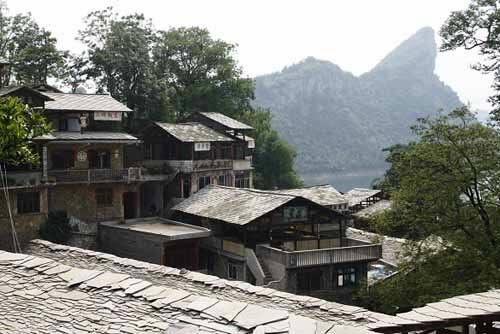 The village was first built during the Ming Dynasty, with a history of more than 400 years. Three sides of the village are surrounded by water. It is built against the mountains according to the local geological conditions. An ancient castle and barracks have remained largely intact in the village. There are about 120 households and three fouth of them are of Buyi nationality and one fourth of them are Miao (miáo 苗) people. 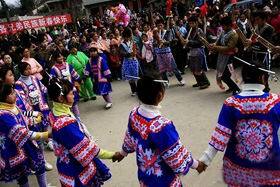 On January the 10th every lunar year, the villagers hold the traditional dancing activities to celebrate the New Year. Buyi and Miao villagers in their best costumes sing and dance to the melodies from the Lusheng (lú shēng 芦笙) and the bamboo flutes to celebrate their own traditional festival. Legends said that long long ago, once some bandits captured the Buyi forefather in the village. The villagers failed to rescue him by themselves and they asked the local Miao people for help. The Miaos played the Lusheng and sang Miao songs to communicate with him and the bandits could not understand. With the help of the Miaos, the forefather was rescued. 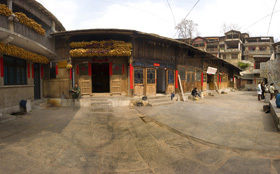 From then on, the local Buyi have formed the custom of singing and dancing to appreciate the help from the Miao. Local people sing and dance on for 3 days for the festival each year. Besides this, Zhenshan Villagers also celebrate the traditional “Siyueba (April 8)” (sì yuè bā 四月八) Festival and the “Qiyueban (July15)” (qī yuè bàn 七月半) Festival. Now, these festivals have become joyous days celebrated by Miao, Buyi, Dong (dòng 侗), Zhuang (zhuàng 壮), Shui (shuǐ 水), Gelao (gē lǎo 仡佬), or even the Han (hàn 汉) people. In Zhenshan, Some young people take this advantage of the chance to make friends and choose their future spouses through the dancing and singing with deep love. Embroider is another important part of the folk custom, which futures its rich contents of flowers, birds, insects and fish. Girls usually make embroiders of special styles and present it as a gift to their lovers. Transportation: take a bus from Hebin Park to Tianhe Pool and get off at Shiban Shao Stop, then walk or take a motorcycle to get into the village, which is 2 kilometer away. There are regular minibuses going to the village too. Tips: Preserved ham, red bean curd, smoked curd are popular local foods. Fish are fresh as they are just brought from the river. Other dishes like dried peppers and sour vegetable soup are worth trying. All the farmhouse restaurants are of the same price, sometimes there may be a discount of 20%.